Canada finally has Netflix—and for a dollar cheaper than its southern pals! Online streaming will cost only $7.99 a month up north, compared to $8.99 in the US. And Netflix's CEO thinks Americans are too self-centered to notice. The Canadian dollar is occasionally the subject of some mockery, but hey—wait! We're just about at dollar for dollar parity. What's more, Canadian customers will be able to stream AMC programming, including the entire first three seasons of Mad Men—something off limits in the US. So, uh, Netflix, what gives? 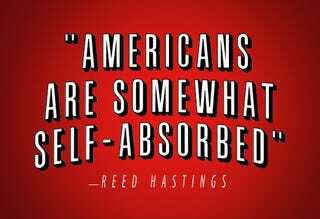 When asked whether he thinks American customers will care about the pricing disparity across the border, Netflix CEO Reed Hastings replied, "How much has it been your experience that Americans follow what happens in the world? It's something we'll monitor, but Americans are somewhat self-absorbed."